People are now the key element of competitive advantage which requires greater diligence. The usual approach taken to identify, select, engage, develop and retain employees at all levels needs additional measures. 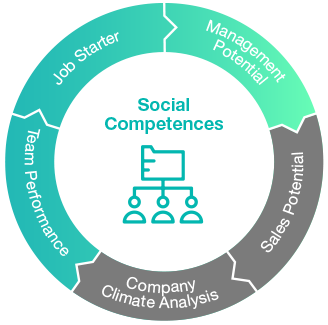 DNLA (Discovering Natural Latent Abilities) includes social competences, leadership styles, entrepreneurial spirit, diversity, potential and much more. For employers, the selection of competent people is vital to achieving corporate success. For managers, the issue is to meet performance targets whilst maintaining motivated and engaged employees. DNLA plays an essential role in meeting both of these challenges and the ambitions of all stakeholders in the organisation. DNLA SP verifies 6 key factors within sales process. DNLA CCA assesses 11 areas of company climate.